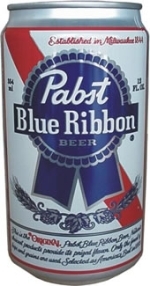 Makes total sense, in fact -- PBR continues to exploit its so-called anti-trendiness. I think the NY Times ran a piece about it a few years ago? I have no data to back this up, but I've definitely observed PBR becoming trendy with the indie-rock set here in the midwest. I'd guess Pabst is responding to this, rather than proactively taking the brand to new places. But is it possible that going to NPR could undo the street cred that's fuelling the brand's resurgence in the first place? PBR is making a big comeback on college campuses in the Midwest. The "beer man's creed" is playing a part in the comeback. Classic PBR has been making a (non-regional)comeback for at least five years, it's the anti-import, smaller size, comfortable rep, working-peoples beer. No pretense. It's been on tap around San Fran for several years now. No barnyard animals, no reptiles, no mountain-cold bs, just beer. PBR, they don't have to say 'IT IS BEER' as a reminder to themselves. PBR began its relationship with NPR by sponsoring the organization's "live concert series," a perfect fit for the brand, considering the music/demographic (is there a difference?) that is chosen. Concerts are (mostly) recorded at the 9:30 Club in Washington DC, where the brand is credited on air in the seconds prior to the streamed concert. Yup, it's what all the self conscious hipsters drink. As is NPR what they listen to. You really just have to check the boxes and you're automatically cool, that's what I loev about America. From the standpoint of a consumer, it makes perfect sense to me. I listen to NPR and I buy PBR. Sometimes I drink it and sometimes I use it to drown the slugs in my garden. I don't think PBR cares either way as long as I'm buying it. drunk 1 like that yesterday.